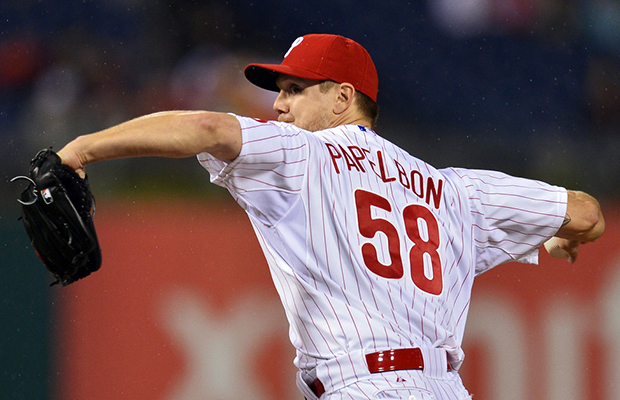 Jonathan Papelbon has loudly voiced his desire for a trade to a contender. Francisco Rodriguez could be on the move if the rebuilding Milwaukee Brewers get an offer they can’t refuse. Yet, for a contender that needs a closer – like the Toronto Blue Jays – Atlanta’s Jason Grilli would cost less in terms of salary and prospects. Over 35 games and 33.2 innings this year, the 38-year-old right-hander has a 2.67 ERA, a 1.10 WHIP, 12.0 strikeouts per nine innings and 24 saves for a surprising Braves team that is 42-43, 4.5 games behind Washington in the National League East and five games out in the NL wild card race. He is getting $3.5 million this season and has a $3 million team option or a $250,000 buyout for 2016. Considering that a club like the Blue Jays also needs to upgrade their starting rotation, and a package of prospects and/or young major leaguers will be required to accomplish that, trading for Grilli instead of Papelbon or Rodriguez would help Toronto GM Alex Anthopoulous more easily complete both tasks. The 34-year-old Papelbon does not overpower hitters with a mid to high-90s fast ball like he did in his early years with the Boston Red Sox, but he has developed into a true pitcher and has a 1.60 ERA with a 0.98 WHIP, 9.4 strikeouts per nine innings, a 5.00 strikeout-to-walk ratio and 14 saves over 32 games. The right-hander is receiving $13 million this season and a 2016 vesting option for $13 million kicks in with 55 games finished this year or 100 games finished between 2014 and 2015. The 33-year-old Rodriguez is posting impressive numbers as well. He owns a 1.45 ERA, a 0.87 WHIP, 10.5 strikeouts per nine innings, a 4.0 strikeout-to-walk ratio and 18 saves over 31 games. His salary is $3.5 million this year, $5.5 million in 2016 and a $6 million team option or a $4 million buyout for 2017. Much like Houston GM Jeff Luhnow rebuilt the Astros into a contender by dealing veterans and young major leaguers alike for top prospects, and growing via the draft and international signings, Atlanta president of baseball operations John Hart is doing the same. He will be active this month. Grilli and outfielder Cameron Maybin are two of his most appealing assets.